Amygdalota, take their name from amygdala, which mean almonds in Greek and are no bake Greek cookies from the Greek islands made with blanched almonds and sugar. They are dipped in rose water and then coated with icing (confectioners’) sugar. There are a few versions of Amygdalota, either baked or not. These cookies are shaped liked small pears with a clove inserted on the top and showered with icing sugar. They are so easy to make that your children would love to help you making them. Blanch the almonds and let them dry. Grind them in any way you like but they must be really thin. Sieve the icing sugar and add the almonds as well as all the other ingredients and mix. Add enough rose or blossom water until they hold together and can be shaped resembling little pears. In a double boiler melt the chocolate with 1 tsp butter and 3 tbsp heavy cream. Dip each amygdaloto in the chocolate and with a fork and a spoon try and carefully get one on the fork, so that excess chocolate will drip off. Serve them in cupcake cases. Another day, I made these cookies the traditiona way but filled with mandarin marmalade! I also made some the traditional way and some with citrus and chocolate. Blanch the almonds and let them dry. Grind them with some icing sugar in a food processor until powdered. Add the remaining icing sugar as well as all the other ingredients and mix. Finally add enough blossom water until they hold together. In a double boiler melt the chocolate with 1 tsp butter and 3 tbsp heavy cream. Mix in the liqueur. Add the melted chocolate in the almond paste, together with the citrus fruit preserve and mix. Shape them into pears and place them on parchment paper to dry. The first recipe is included in my cookbook Mint, Cinnamon & Blossom Water, Flavours of Cyprus, Kopiaste! On Christmas Eve one of the few traditions, preserved in its entirety to this day, is Kalanta. Kalanta are similar to Christmas carols and are sung on Christmas Eve, New Year’s Eve and Epiphany Eve, each time with a different song. All the children go around from house to house in small groups, some playing a musical instrument such as a guitar or a harmonica but the most usual one is a metallic triangle held in one hand and hit with a wand producing a metallic sound. On each of the above three occasions they would sing different carols, which usually describe the occasion and end up by wishing the landlord good health and prosperity. In the past the children would be given traditional sweets such as kourabiedes, melomakarona etc., but now they are only tipped with some coins. These are the traditional Carols, sang on Christmas Eve. I also wish all of you Happiness, Health and Prosperity. Mmmhhh, with white chocolate… Nice song! These look amazing, I love almonds and white chocolate. That first photo is great! Have a great holiday. The amygdalota look amazing Ivy! The white chocolate is a nice touch. All the best wishes for you and your family this coming festive season. Chronia Polla! 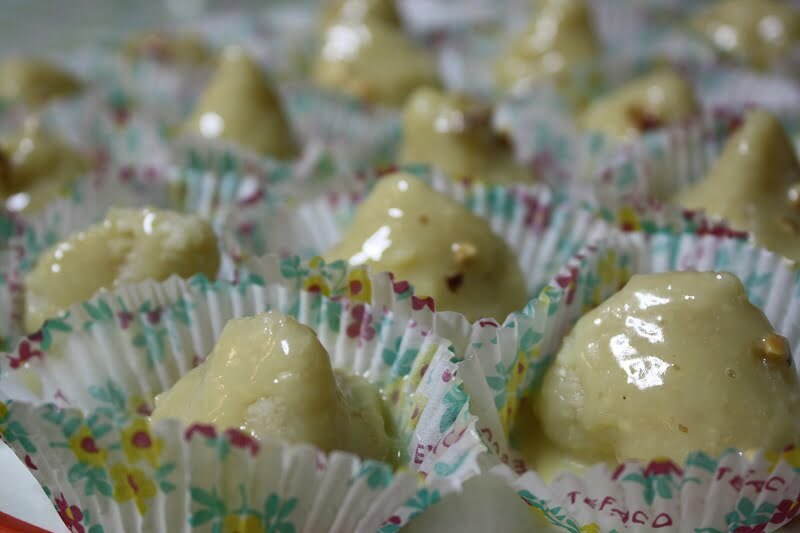 Amygdalota…gotta have them during Christmas and decadent additions like white chocolate are called for! I wish you and your family and Merry Christmas, health & happiness in 2009.
ooh i love the songs ho ho ho ho… police stops my car (sing to feliz navidad) from the Christmas song Medley 😀 I think I loved most is My Favourite Things…always reminded me of The Sounds Of Music! I always hummed this song when I’m sad. Thank you so much for sharing the music! As always Ivy, something beautiful and so yummy sounding. There is something so festive about white. Definitely no one will go hungry in your home. All of these traditional desserts look delicious. Merry Christmas to you and your family! These look delightful Ivy. Merry Christmas to you and your family! yummylicoius! Kala Christougenna “Merry Christmas” to you too! the almond dessert looks very tempting to palates…wow. lovely looking amygdalota. I’ve never tasted any but the ingredients so appeal to me that I’m sure I’d love them!